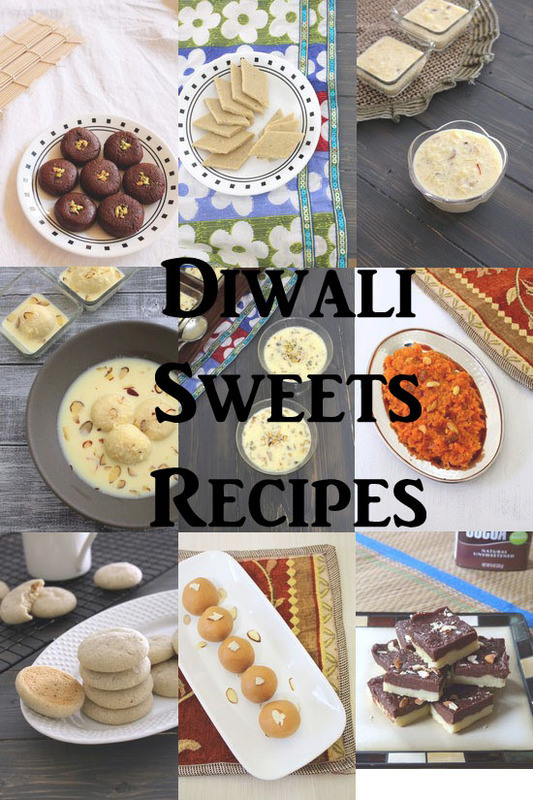 Here I have made the list of whole collection of diwali sweets recipes. All of them are easy to make at home. 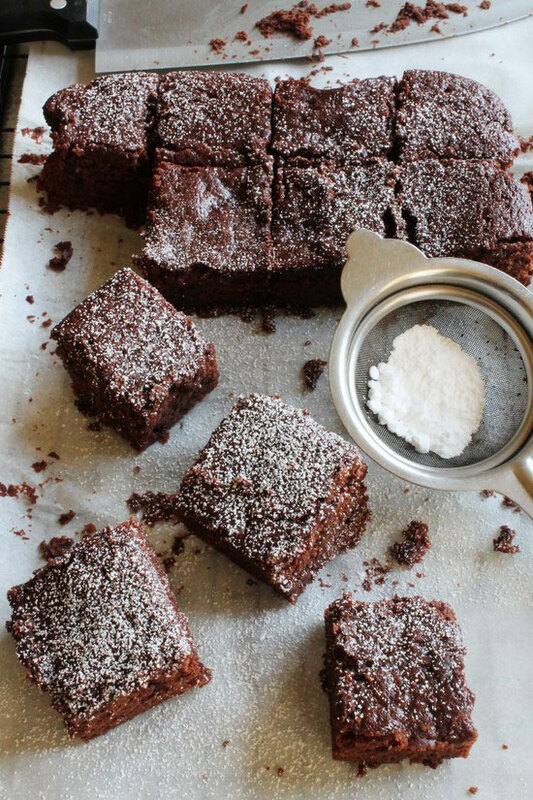 All the recipes have step by step photos with possible tips and tricks so beginners can also make them without any fear. Diwali or deepavali is the festival of lights and it is celebrated all over the India every year. This is the biggest festival we celebrate in our family. We usually start preparing for diwali at least 10-15 day before. We clean and decorate the house, do some shopping. We also make many snacks and sweets at home. Few sweets we buy from shop as well. 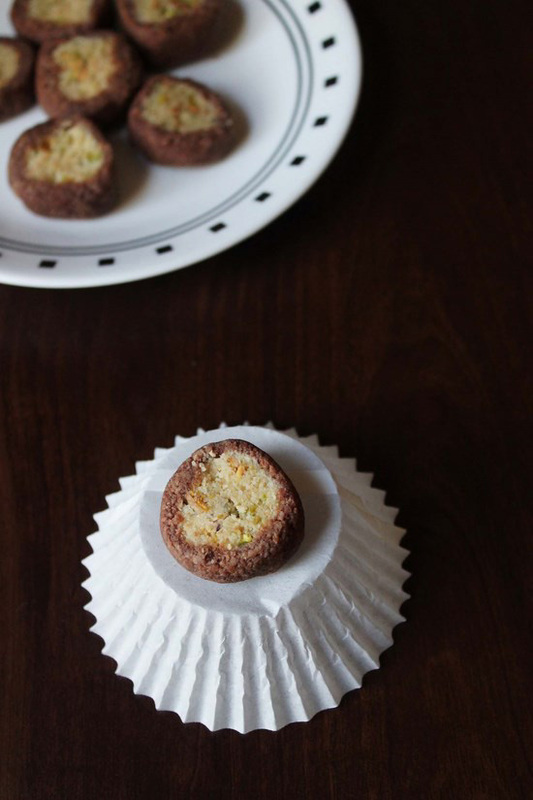 We usually give a box of sweet away as a gift to relatives and friends on the new year day. We also serve to the guests who came for the new year wishes. This year diwali is on 7th Nov 2018. But the celebration starts two days before and lasts for five days. 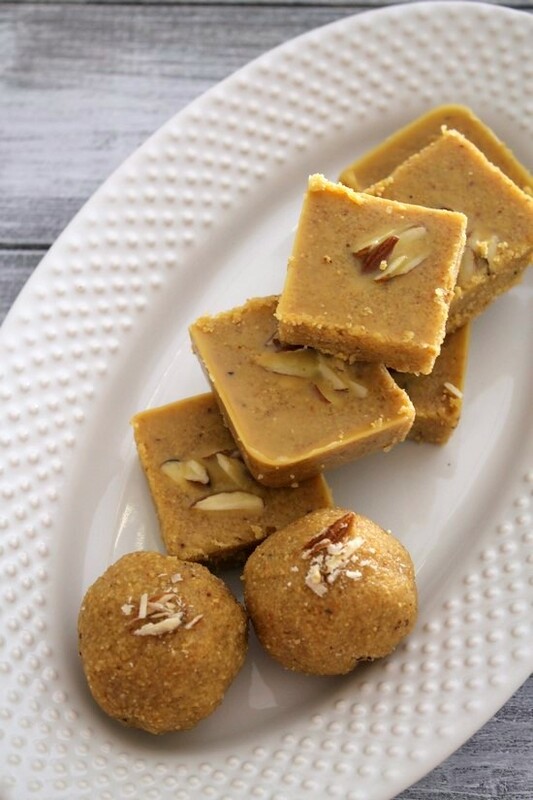 Besan ladoo – made from three main ingredients Ghee, besan (aka gram flour) and powdered sugar (aka boora, tagar). 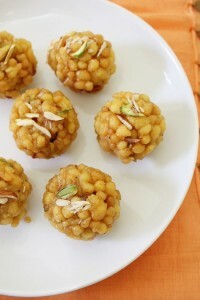 Boondi ladoo – Freshly made boodi are soaked into sugar syrup and shaped into ladoo. 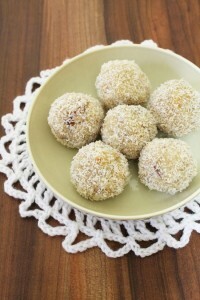 Coconut ladoo – These are made with desiccated coconut, mawa (milk solids) and powdered sugar. 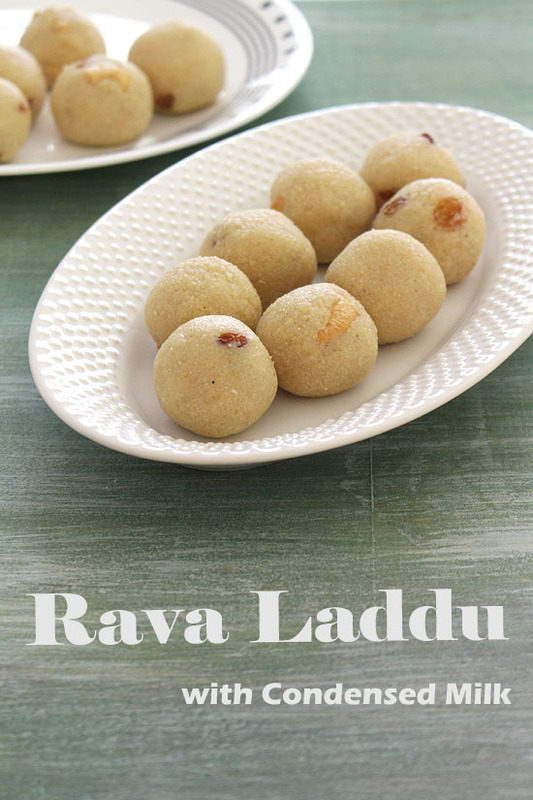 Rava besan ladoo – simple and easy laddu recipe made from semolina, gram flour, ghee and powdered sugar. 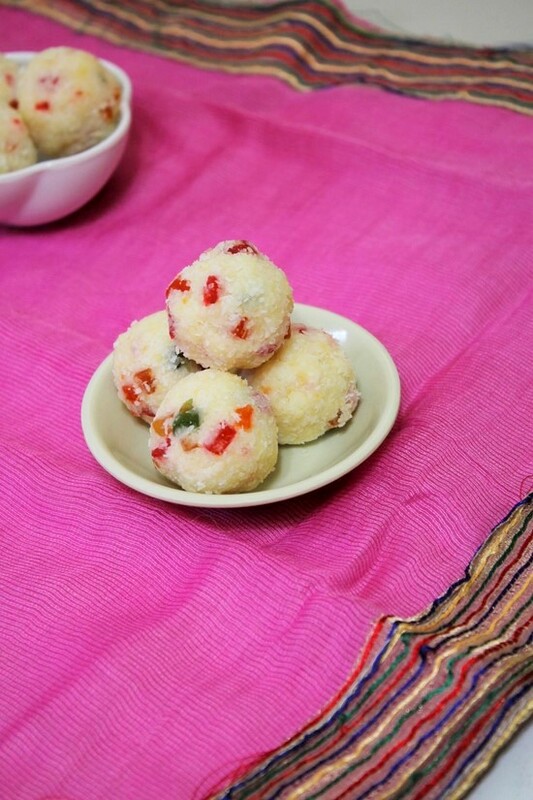 Coconut ladoo with condensed milk – quick and easy ladoo recipe with only four ingredients. 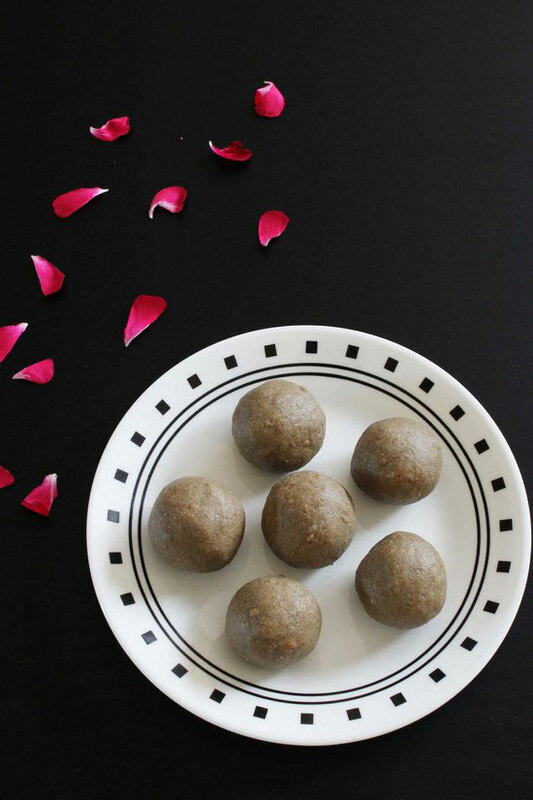 Kuler ladoo – It is made from just three ingredients Black millet flour, jaggery and clarified butter. 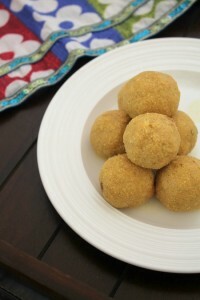 Magaj ladoo – Gujarati style of making besan ladoo.made from ghee, coarse chickpea flour and sugar. 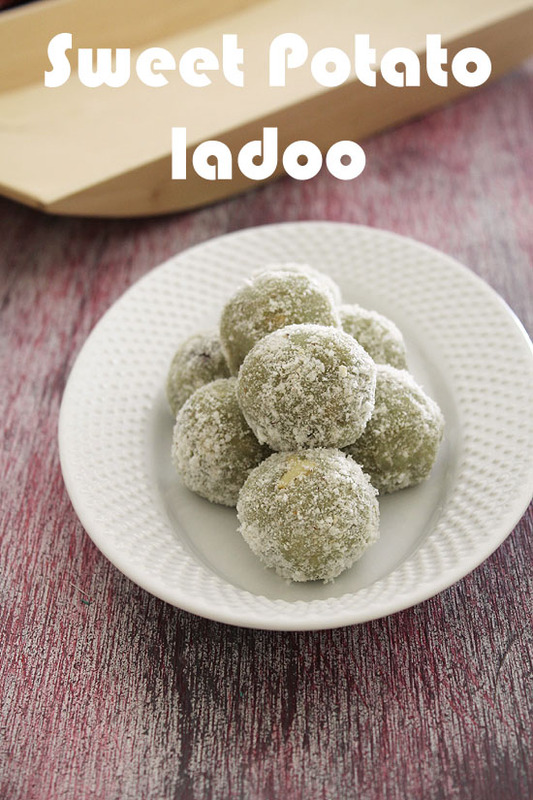 Sweet potato ladoo – Healthy ladoo made with very less sugar. 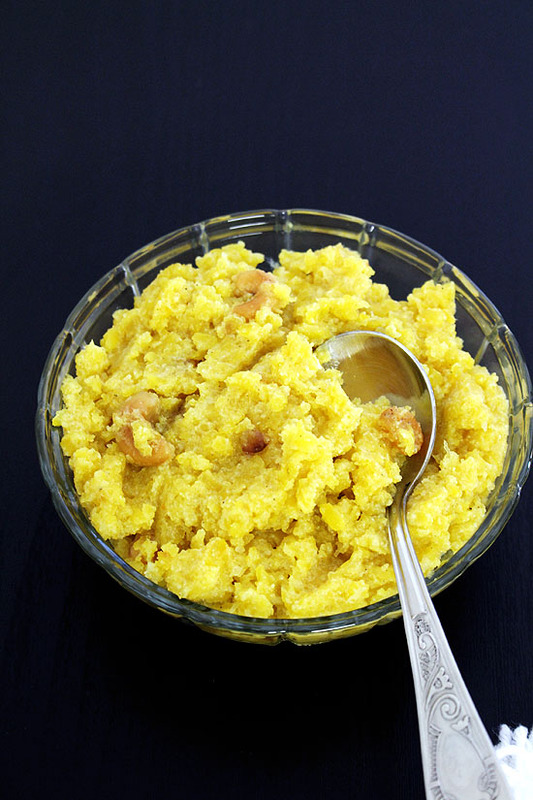 Sheera recipe – the most popular Indian dessert made from semolina, clarified butter (ghee) and sugar. Also known as sooji halwa. 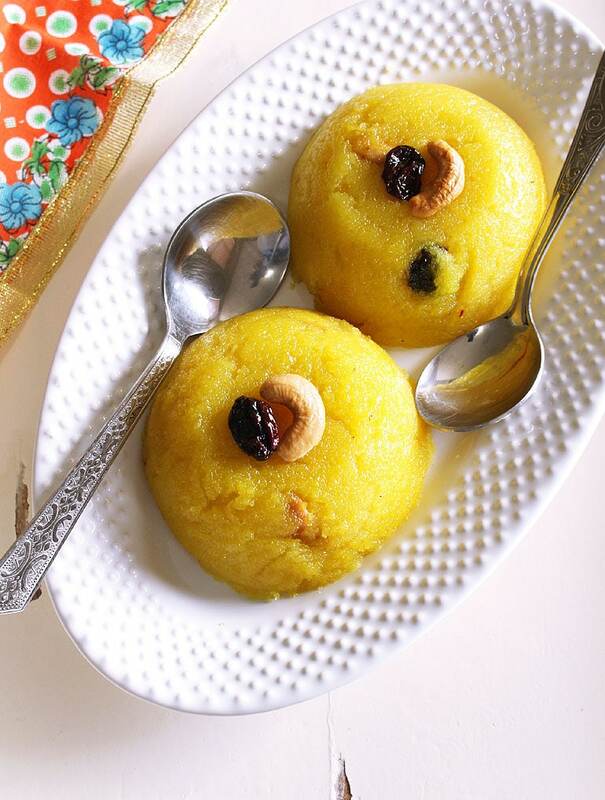 Rava kesari – similar to sooji halwa, but the procedure is different. This is south Indian version. 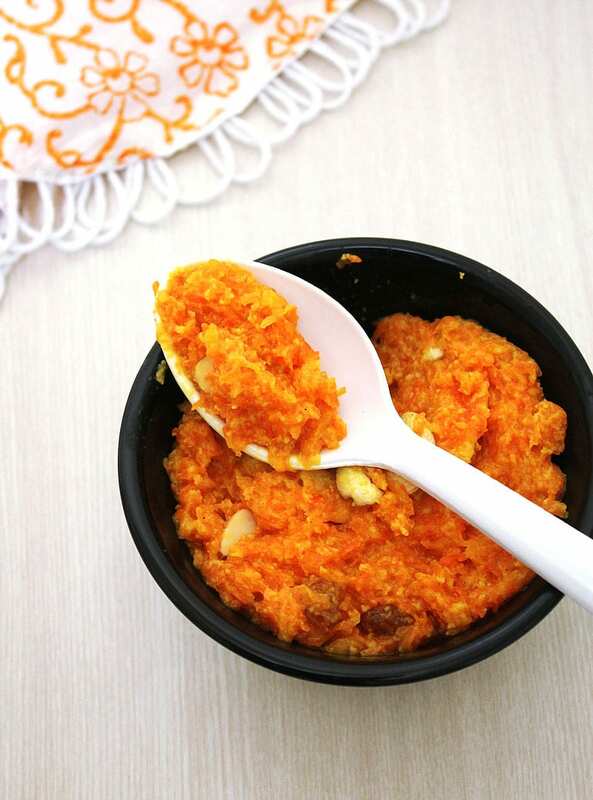 Carrot halwa – Popular North Indian halwa made with Traditional method.Made with only three ingredients Carrot, sugar and milk. 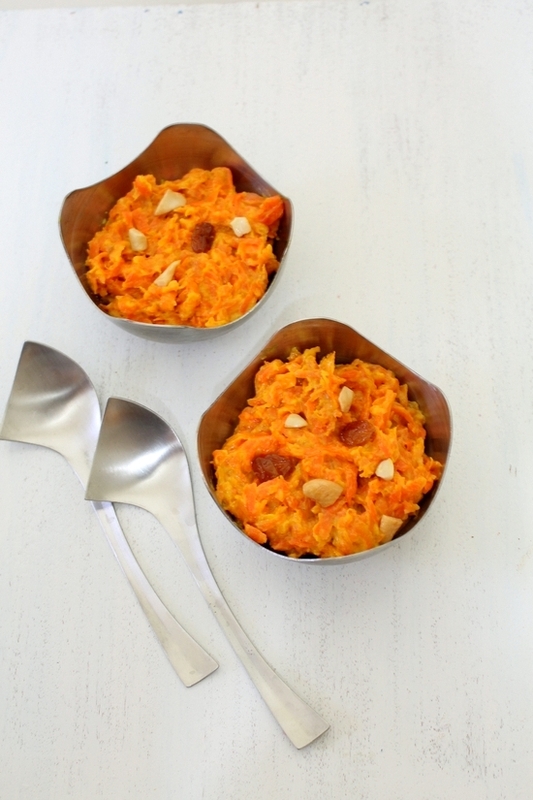 Gajar ka halwa in pressure cooker – a quick version made from grated carrots, milk, milk powder and sugar. 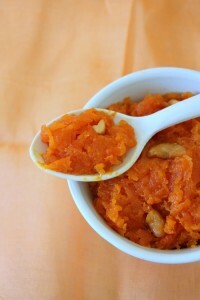 You can try this Instant pot carrot halwa. 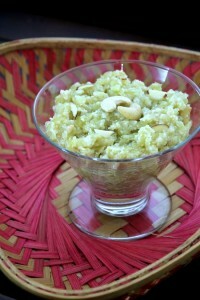 Lauki halwa – sweet dish made with bottle gourd, milk and sugar. 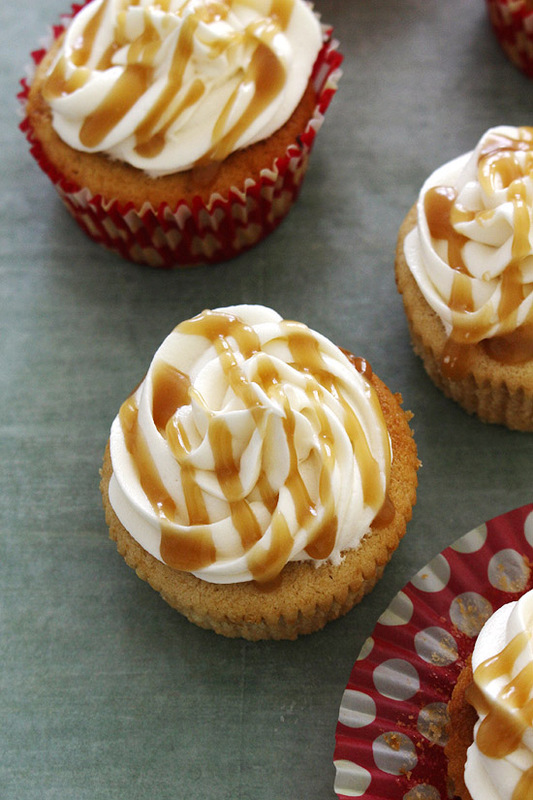 It is flavored with cardamom powder. 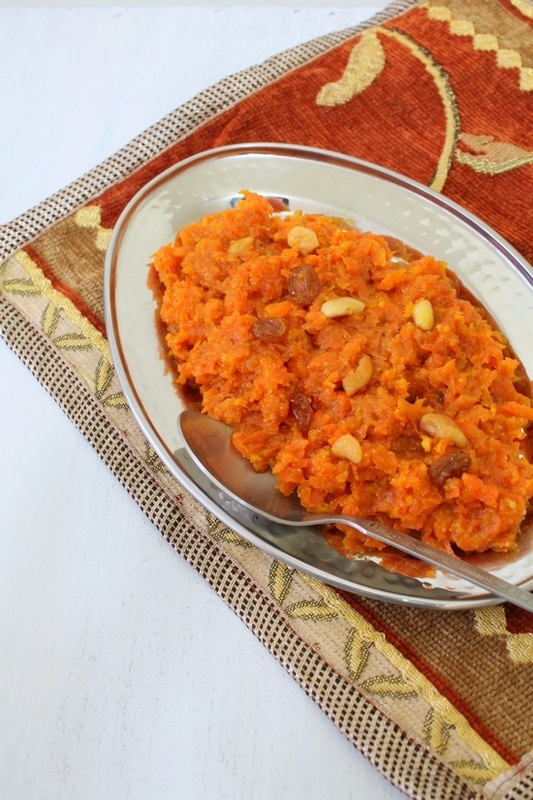 Papaya halwa – made from ripe papaya fruit. 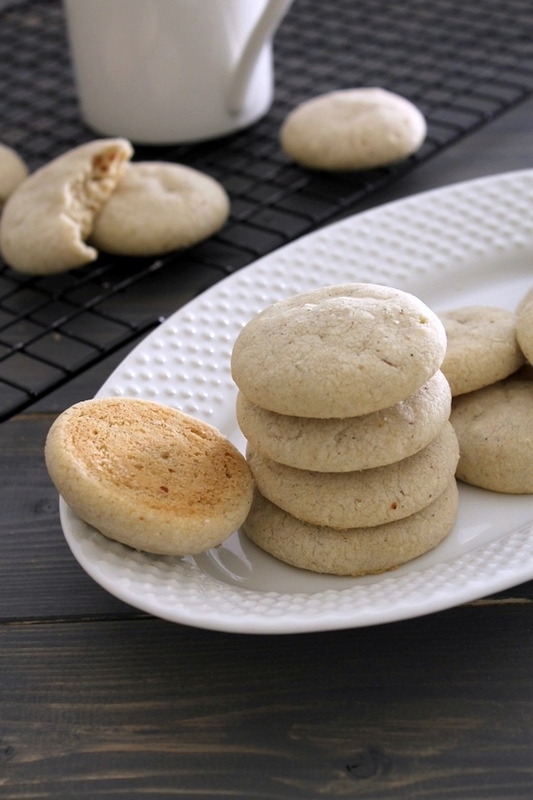 It is flavored with cardamom seeds powder and cashew nuts. 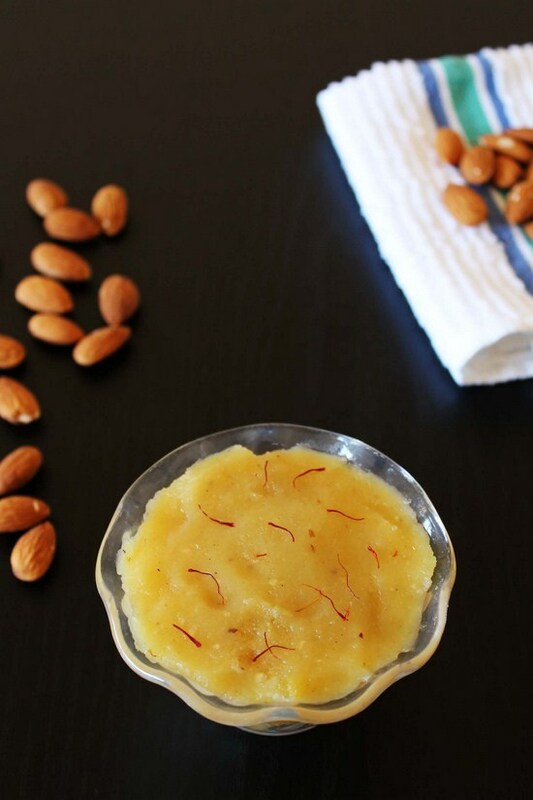 Atte ka halwa – A popular North Indian halwa recipe made from whole wheat flour, ghee (clarified butter) and sugar. 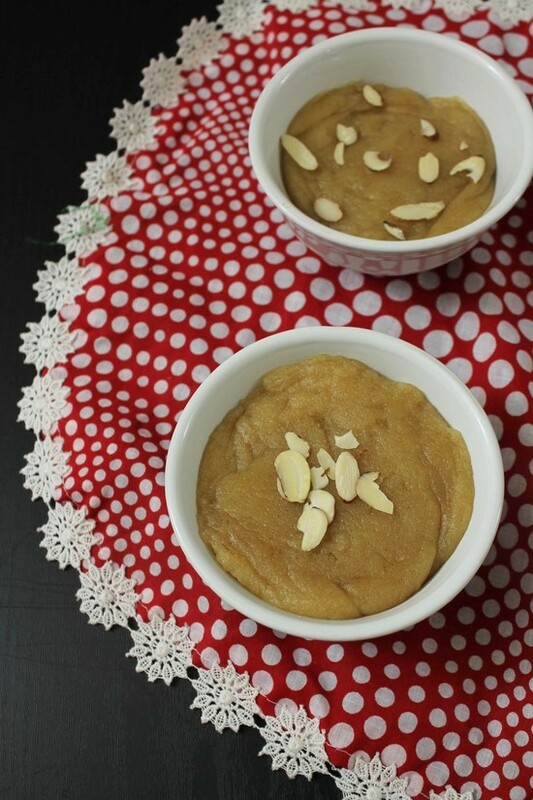 Banana halwa – It is made from semolina, sugar and banana. 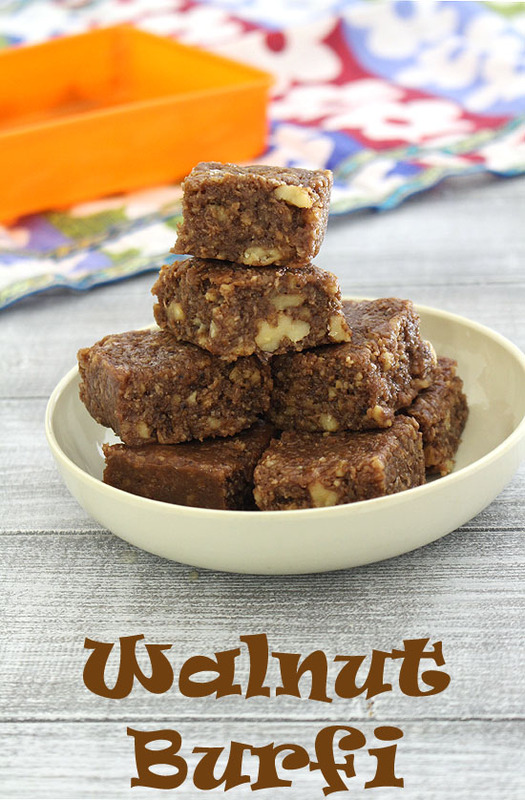 It is similar to the sooji halwa with addition of banana. 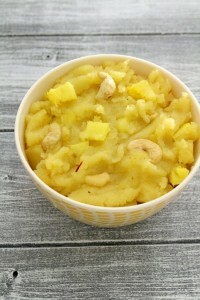 Pineapple halwa – made from semolina, sugar, clarified butter and pineapple (pieces and puree). 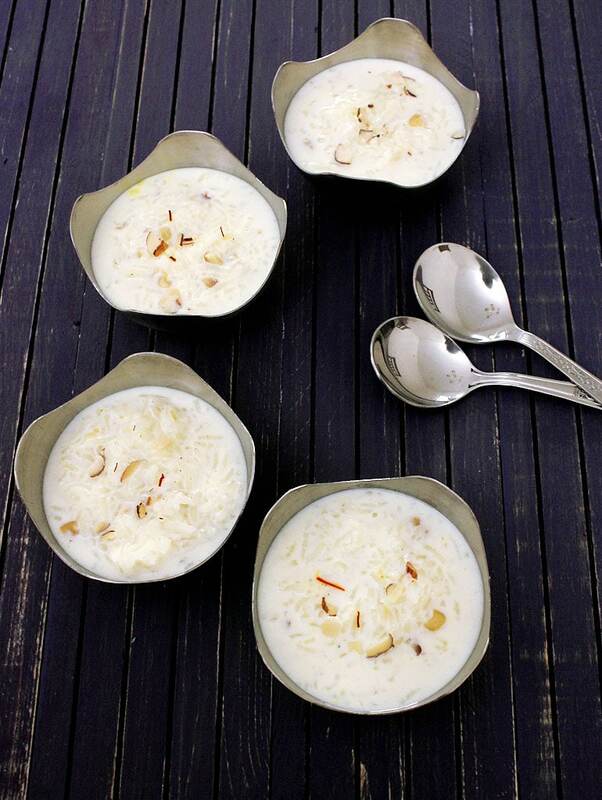 Rice kheer – popular and traditional chawal ki kheer made from raw rice, milk and sugar. 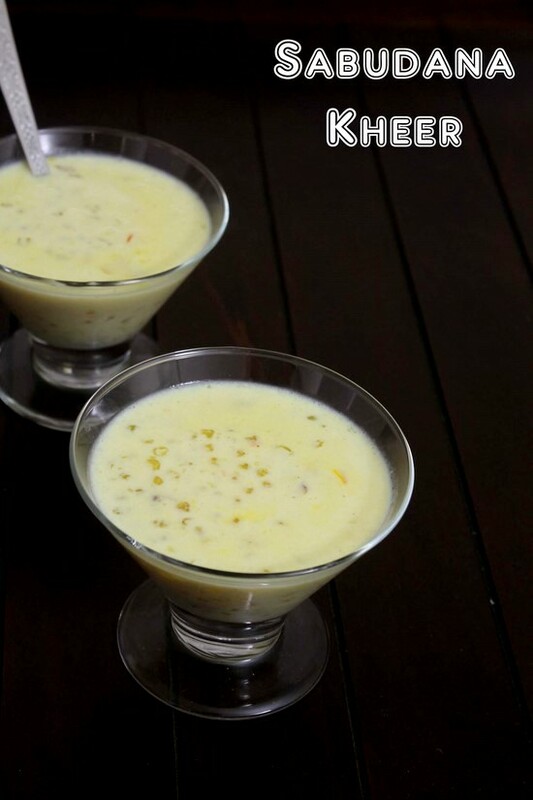 Rice kheer with condensed milk – instant rice kheer recipe made with cooked, leftover rice, milk and condensed milk. 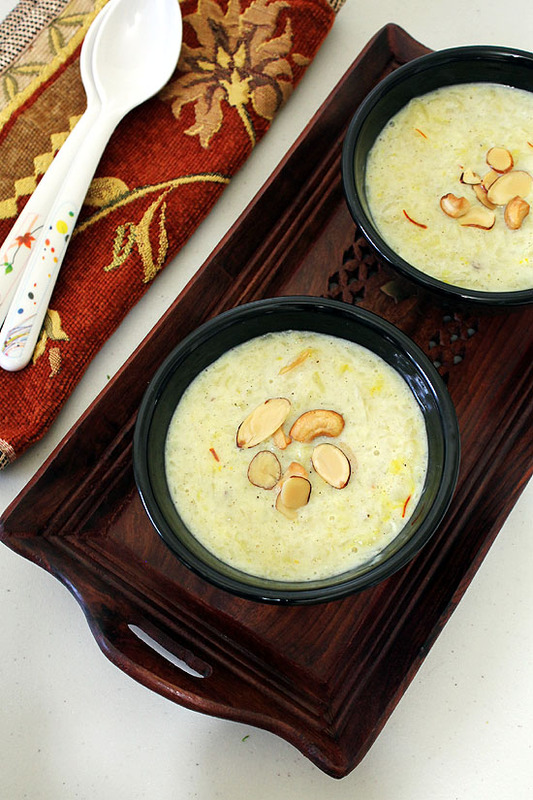 Phirni – Ground rice is simmered in milk. 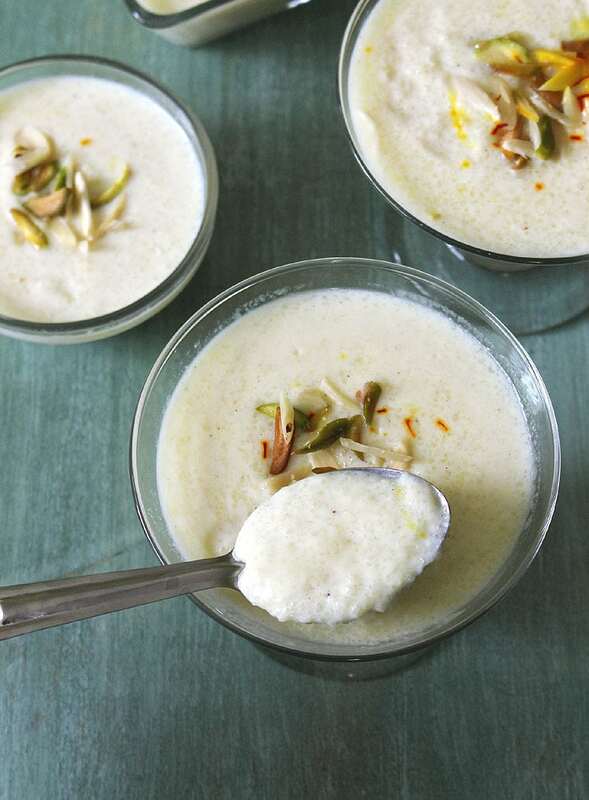 Slightly similar to kheer but it has thick consistency. 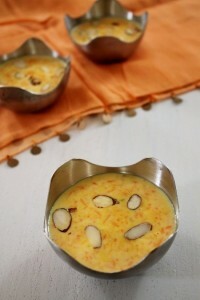 Carrot kheer – easy to make and delicious dessert recipe made from grated carrot, milk and sugar. 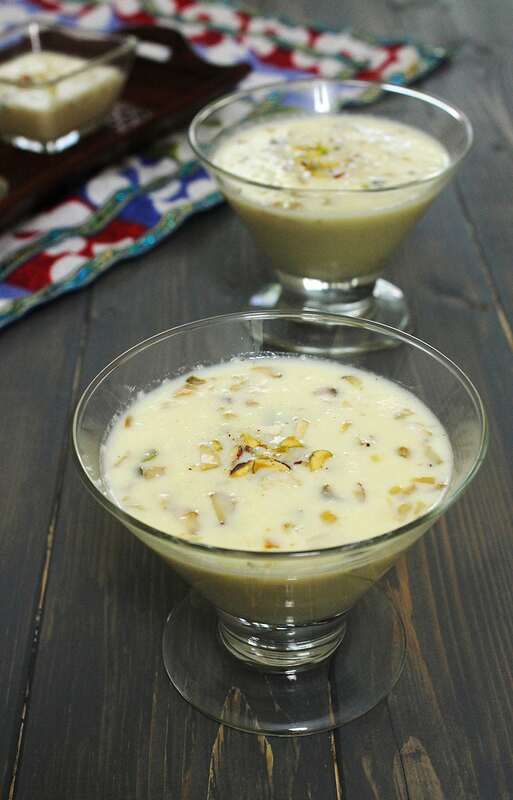 Lauki kheer – Yes vegetable can be used in making this simple yummy dessert. It is made from bottle gourd. 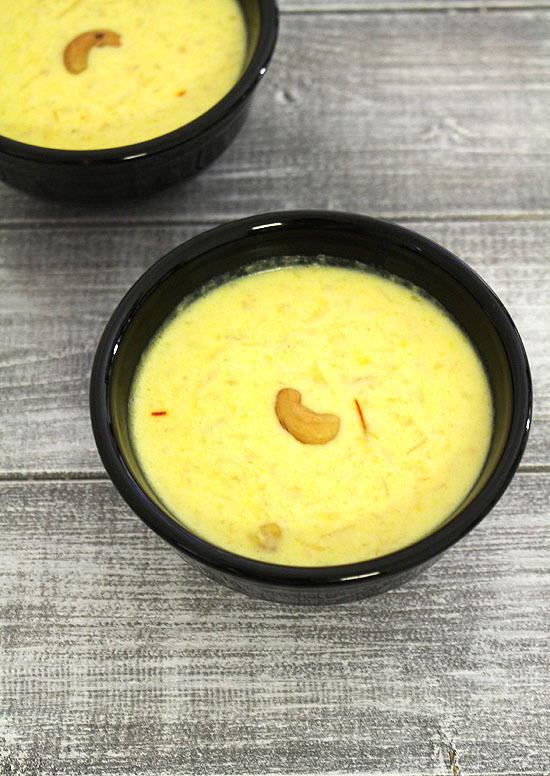 Pumpkin kheer – grated kaddu is cooked in milk and sweetened with sugar and flavored with saffron, cardamom. 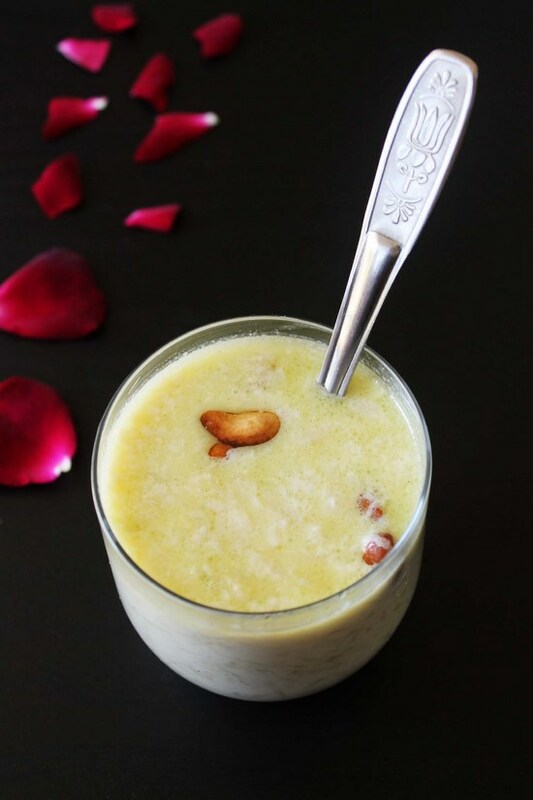 Paal payasam – A south Indian style rice kheer made in pressure cooker. 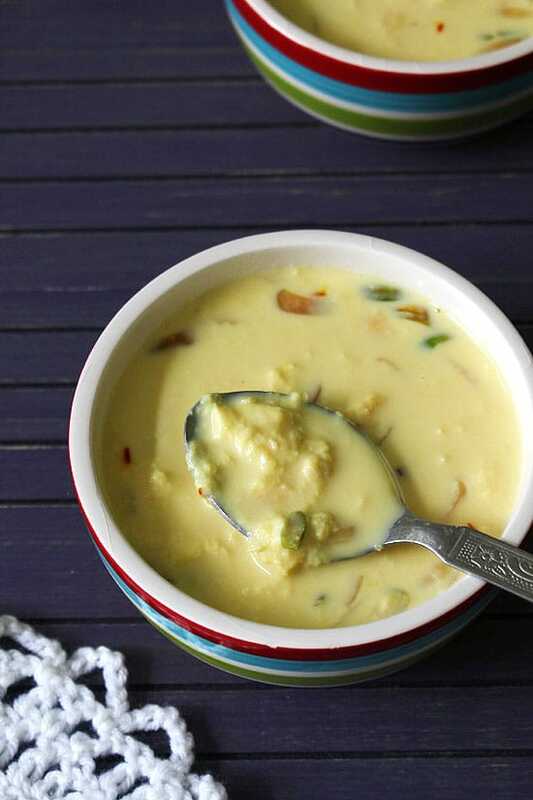 Paruppu payasam – a south Indian version of making moong dal kheer. 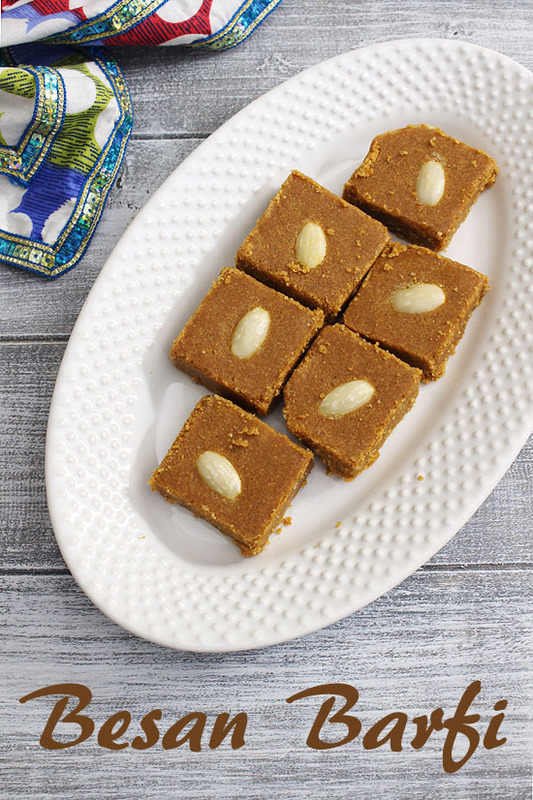 It is made from moong dal, coconut milk and jaggery. 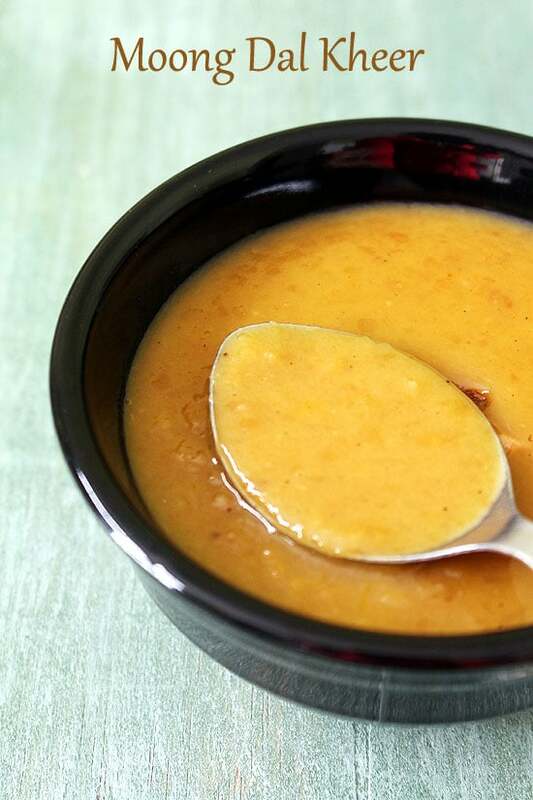 Sweet potato kheer – a healthy kheer made from sweet potatoes with less sugar. 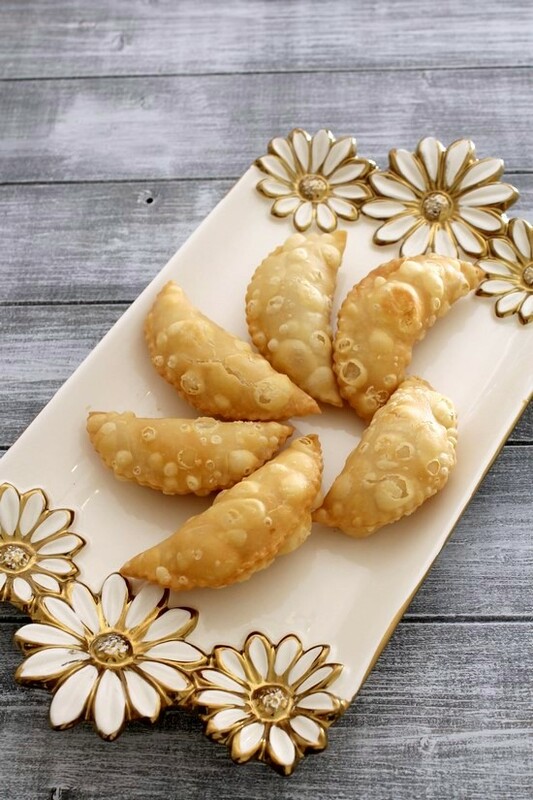 Peda recipe – this is an instant version of making doodh peda or milk peda. 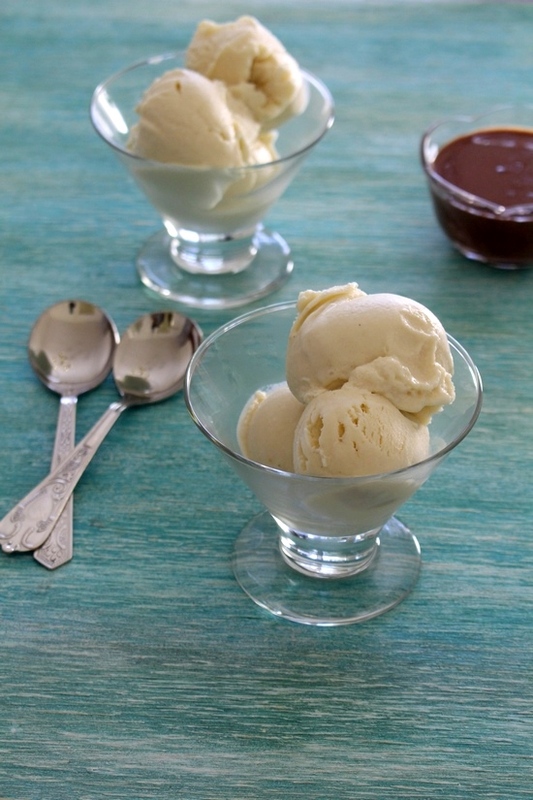 This is made with sweetened condensed milk. 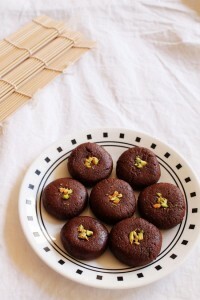 Chocolate peda – Only three ingredients are required: Khoya, Cocoa powder and sugar. 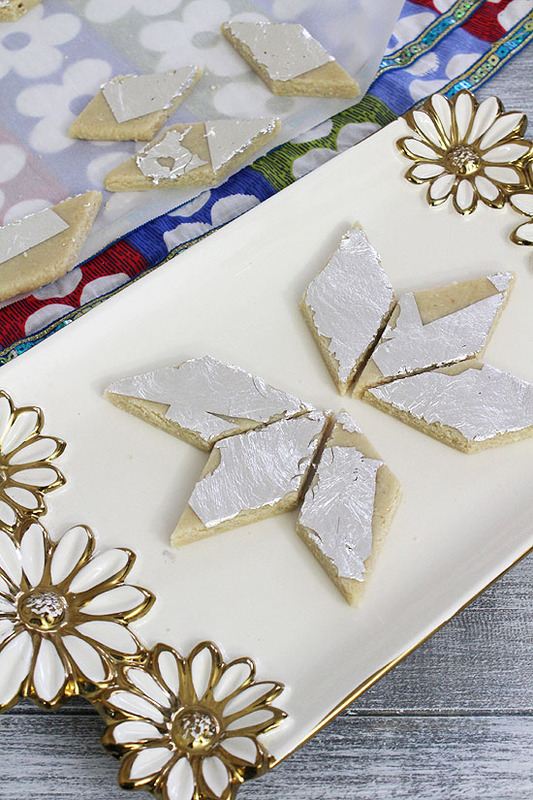 Kaju katli – one of the most popular Indian sweets that is made during the festivals especially Diwali. 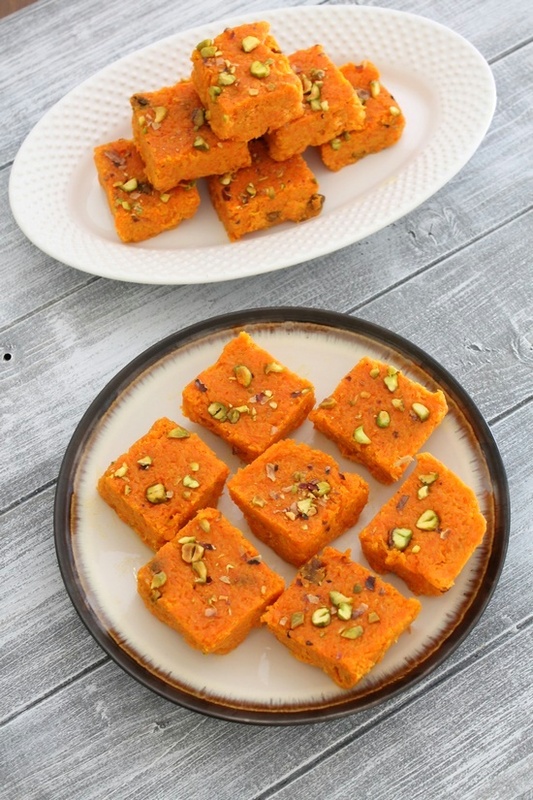 Carrot burfi – made from grated carrot, heavy cream, condensed milk and khoya. 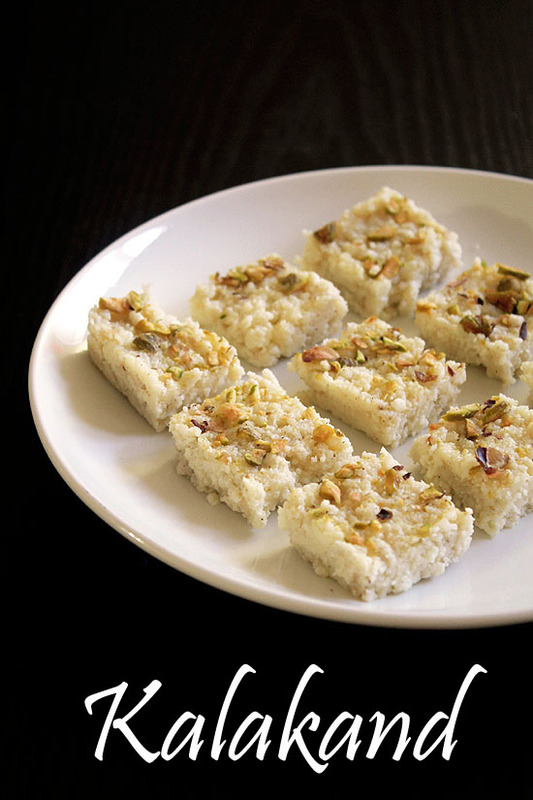 Lauki barfi – another barfi made from vegetable. 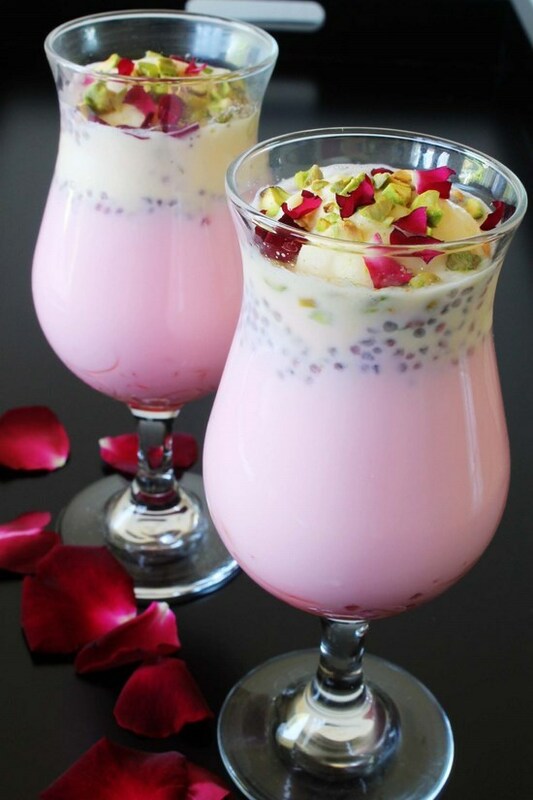 It is made from grated bottle gourd, khoya, sugar and milk. 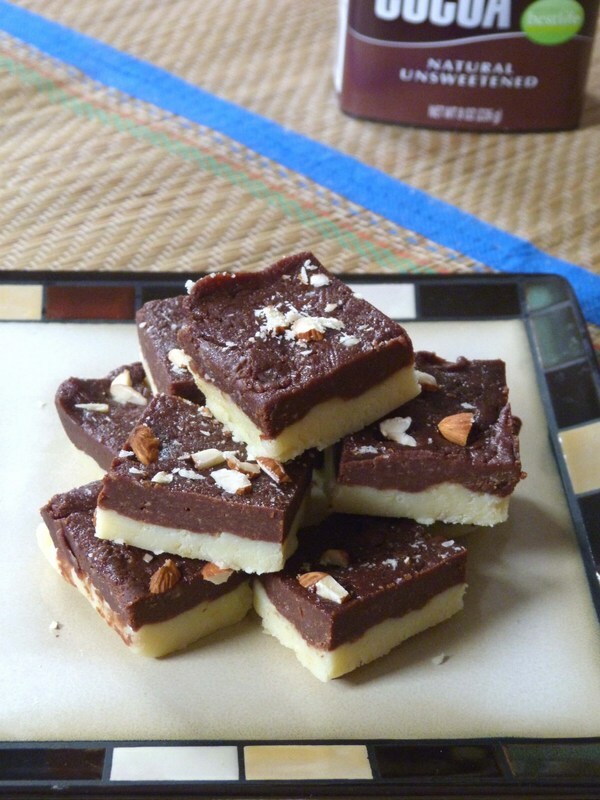 Chocolate burfi – Two layered burfi where bottom layer is plain mawa and top is chocolate. 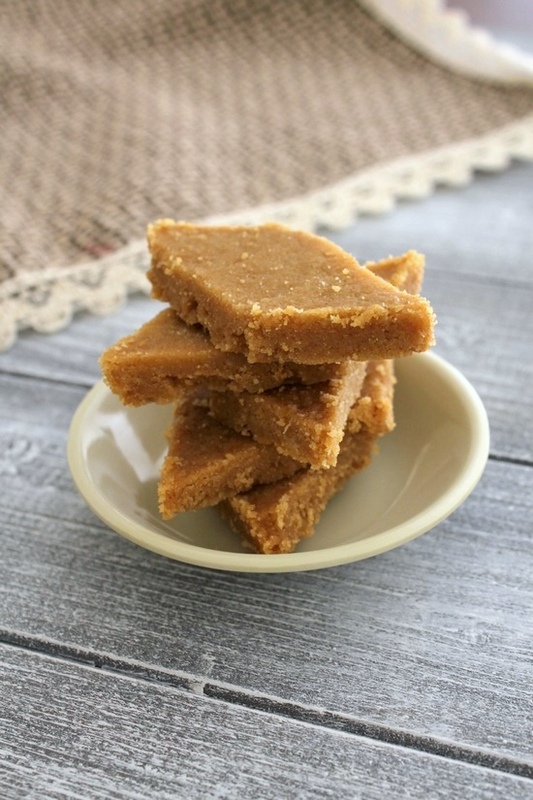 Besan barfi – the old popular barfi made from gram flour, sugar and ghee. 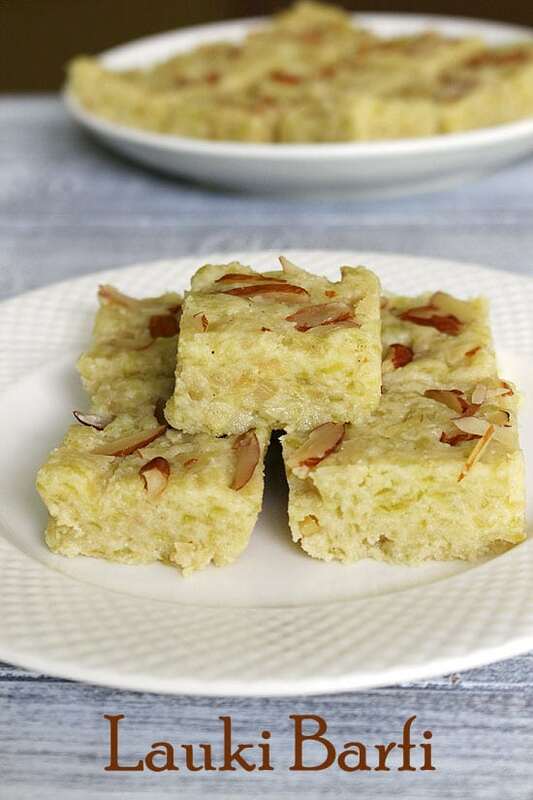 Walnut burfi – QUICK Indian sweet recipe made with walnuts, coconut and condensed milk. 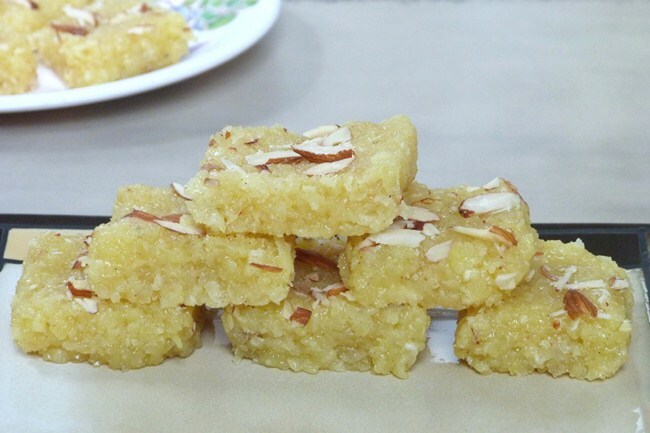 Kopra pak – Gujarati style coconut burfi recipe made from freshly grated coconut. 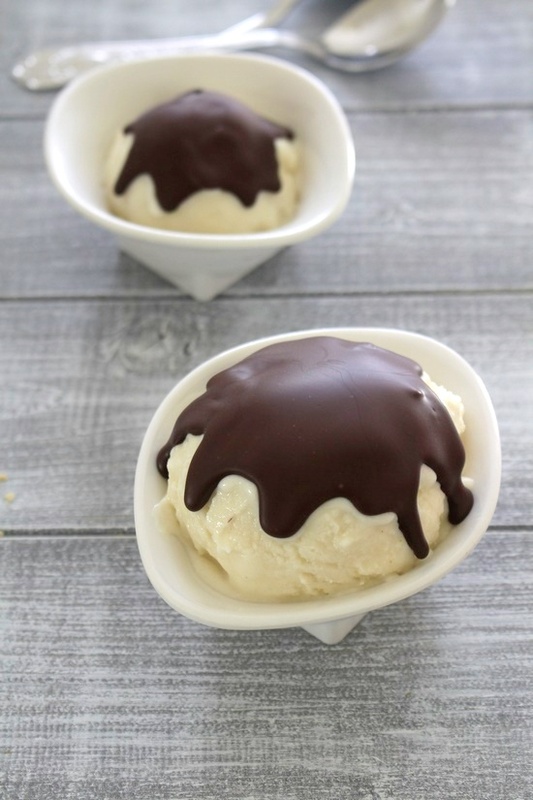 Chocolate pista roll – The outer layer is made from khoya and cocoa powder. 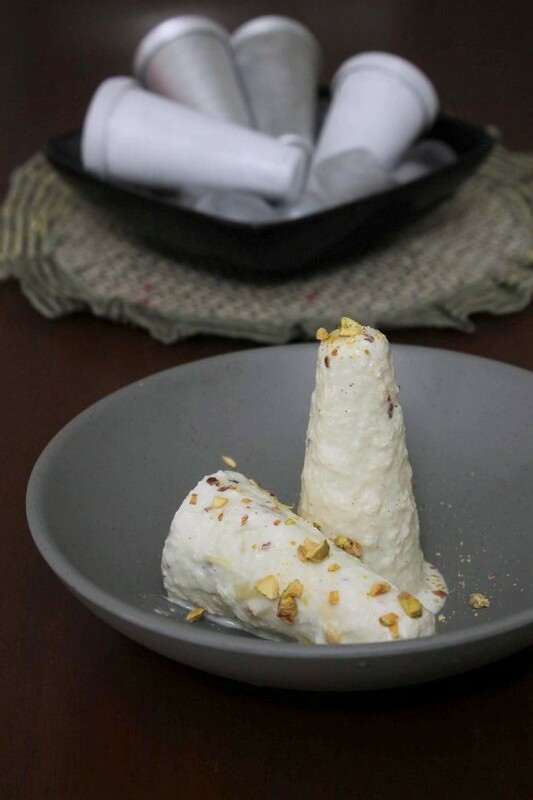 While inside filling is made from khoya and chopped pistachio. 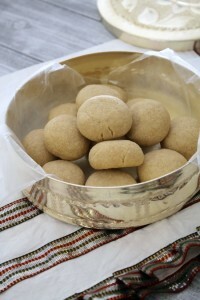 Sukhdi recipe – Authentic Gujarati sweet made with ghee (clarified butter), atta (whole wheat flour) and gur (jaggery). 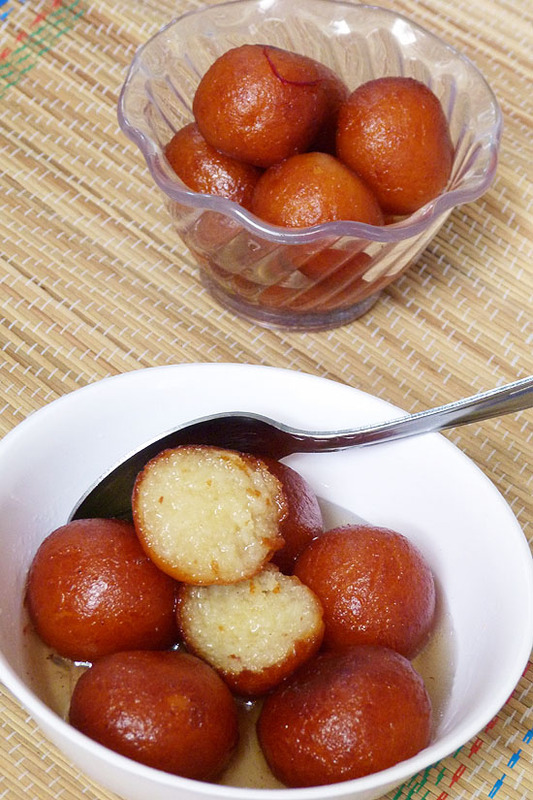 Gulab jamun – The traditional method of making it. 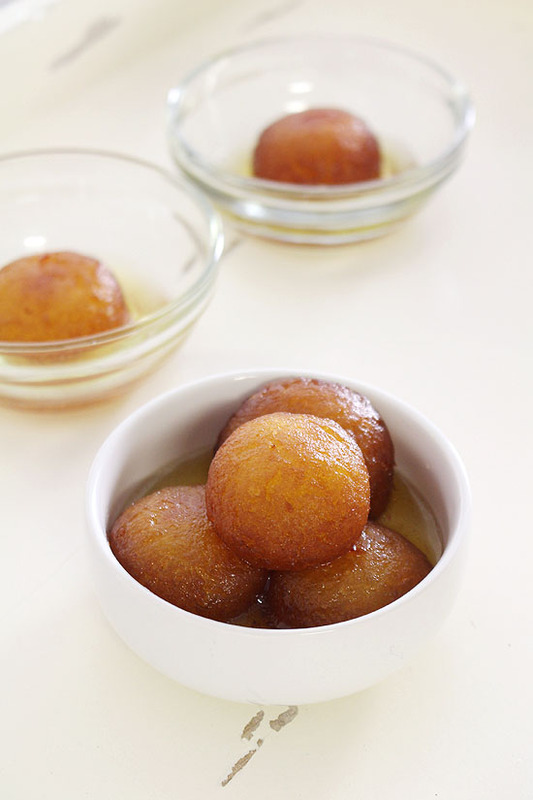 Fried balls are dipped into sugar syrup. 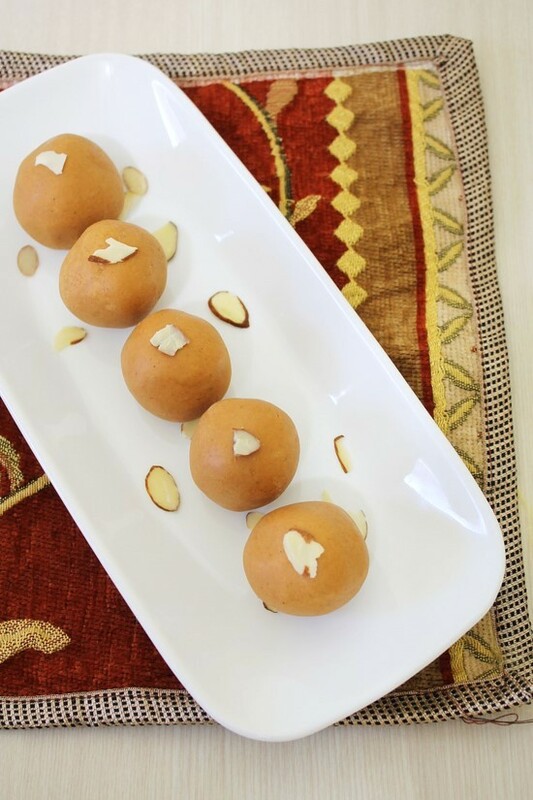 Milk powder gulab jamun – These are soft, juicy, melt in your mouth kind with perfect sweetness and richness. 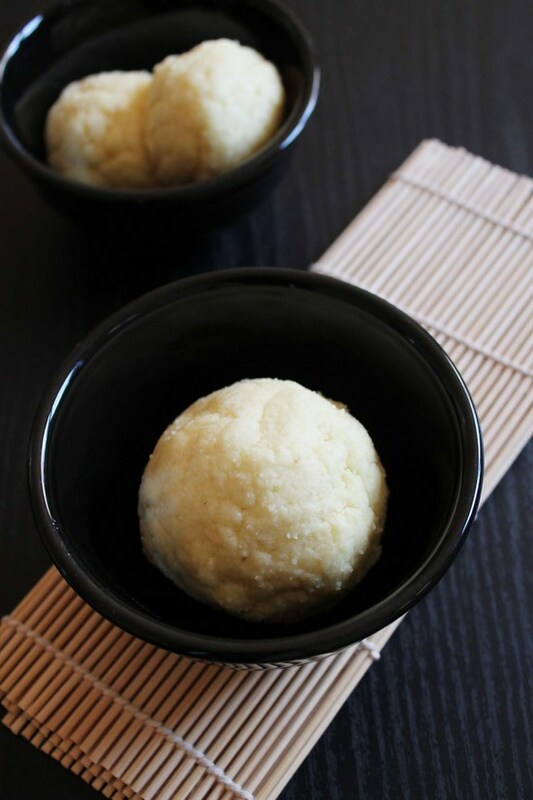 Rasgulla – A traditional bengali sweet recipe. 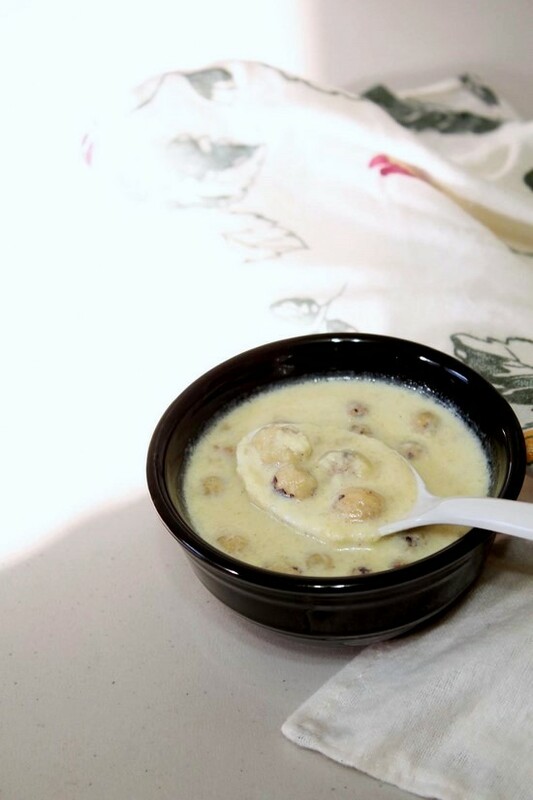 Soft and spongy, melt in your mouth milk solids ball are in sweet sugar syrup. 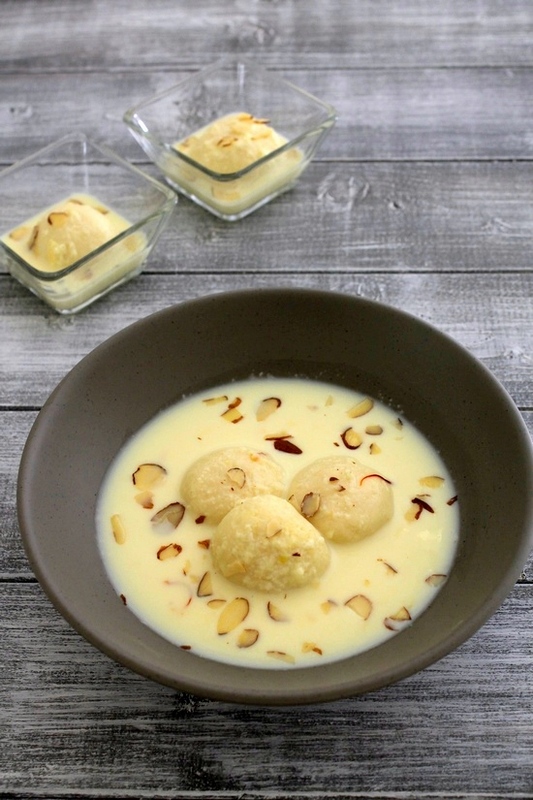 Rasmalai – spongy rasgullas soaked in rich, sweet, thickened, saffron flavored milk. 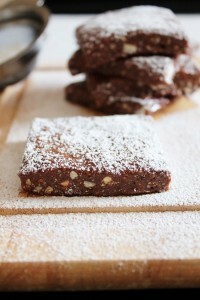 Garnished with sliced almonds. 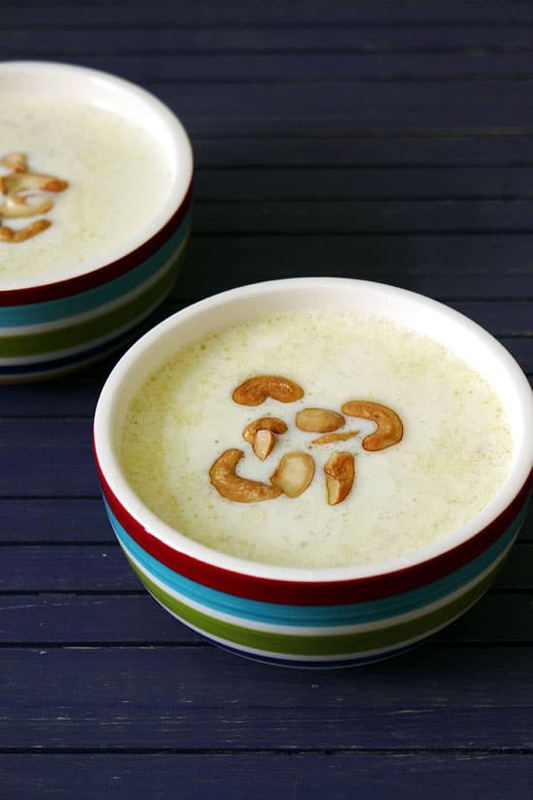 Basundi – Sweetened and thickened milk with chopped nuts, flavored with cardamom and saffron. 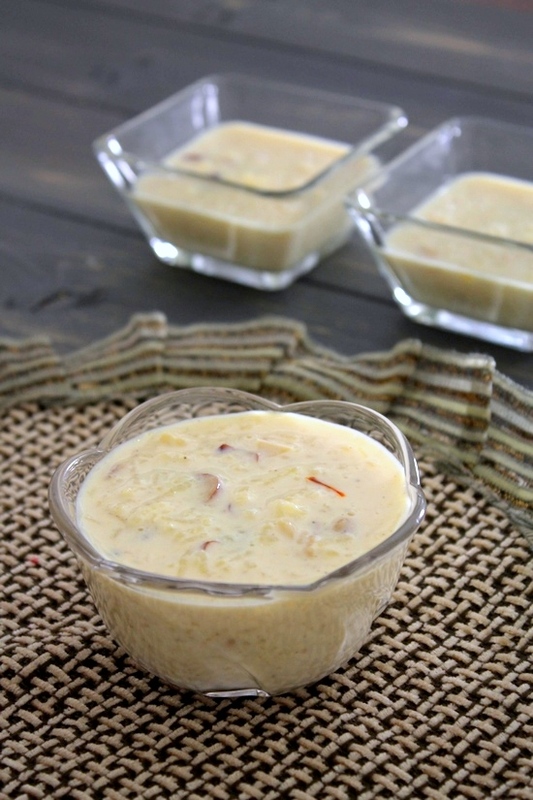 Rabri – A classic North Indian dessert recipe made with traditional method. 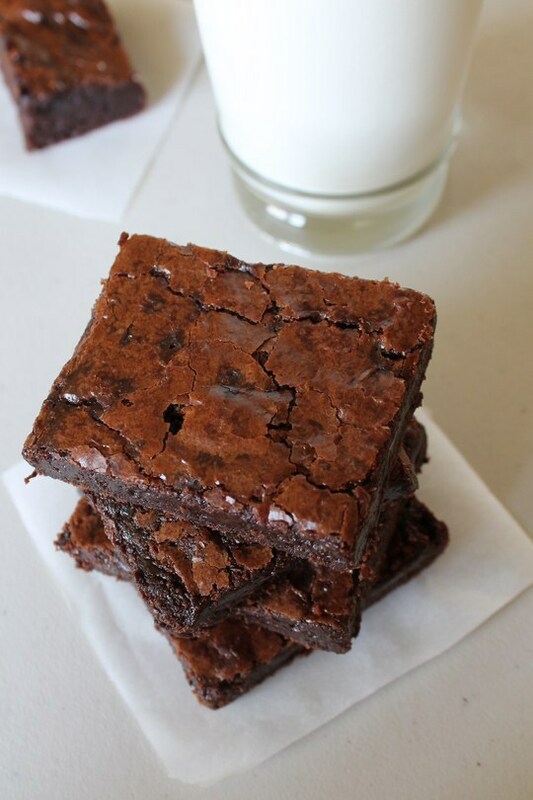 This is made with very minimal ingredients but the taste is out of the world. 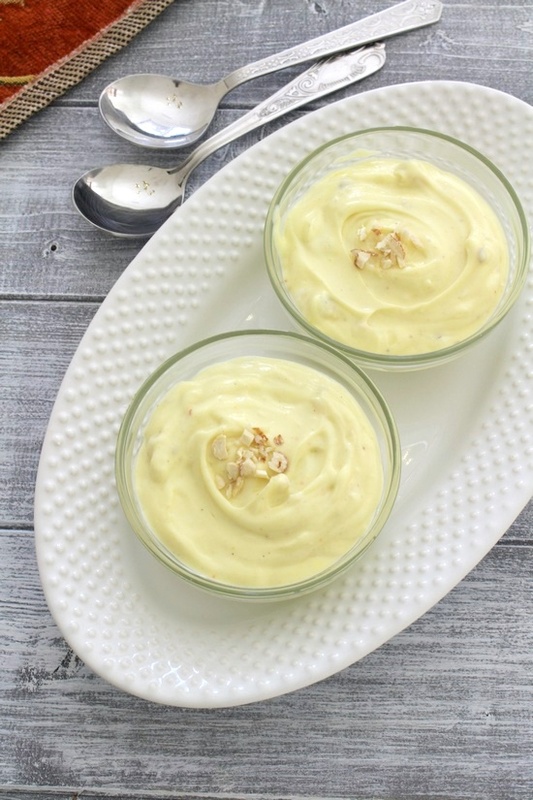 Shrikhand – the traditional sweet from Gujarat and Maharashtra. It is also known as ‘Matho’. 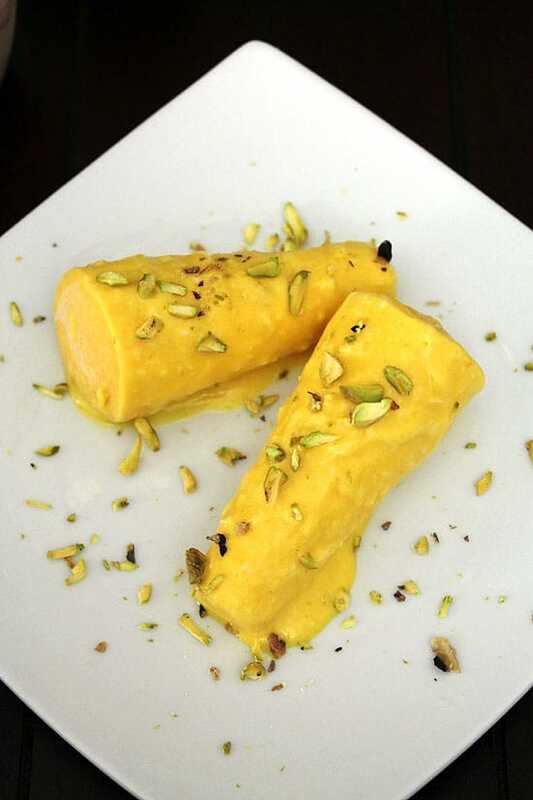 You can try mango shrikhand. 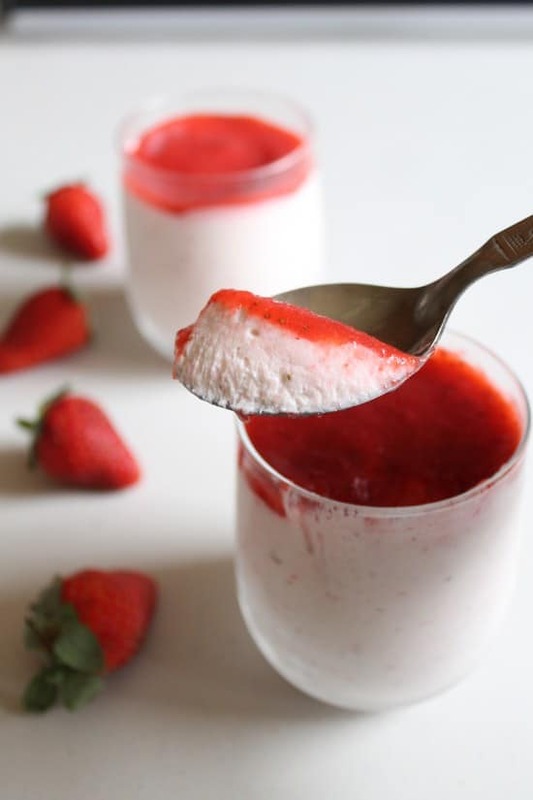 Fruit cream – Mixed fruits are mixed with sweetened, whipped cream. 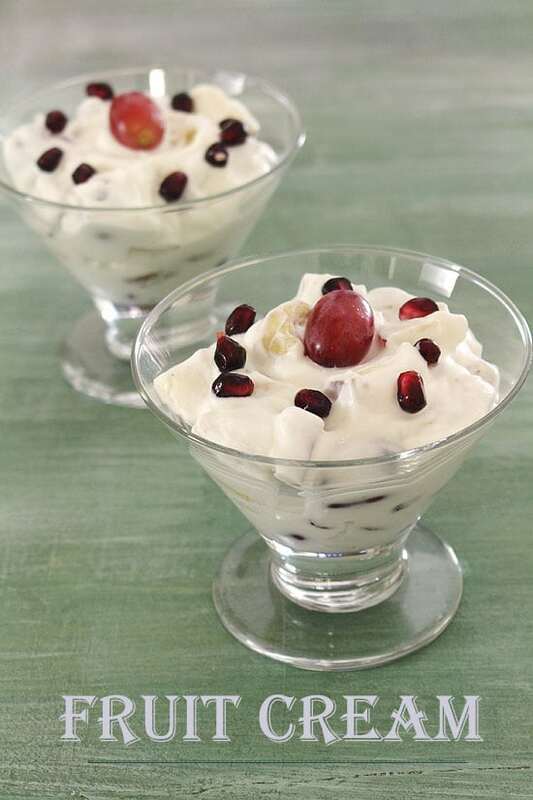 This is also called fruit salad with cream. 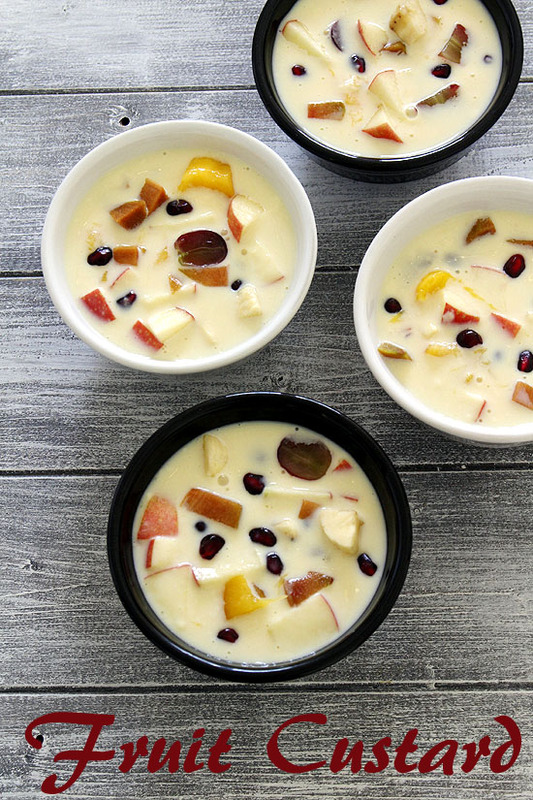 Fruit custard – mixed fruits are added into sweet, rich and creamy custard. 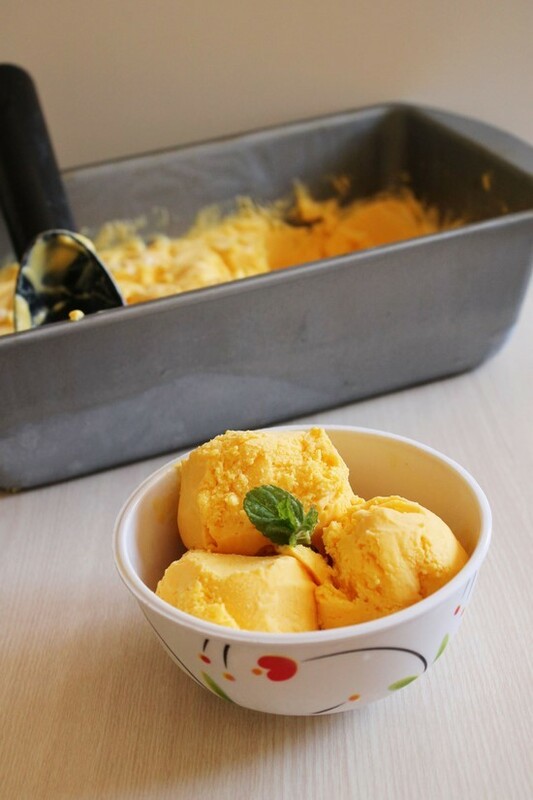 I have shared another version, mango custard. 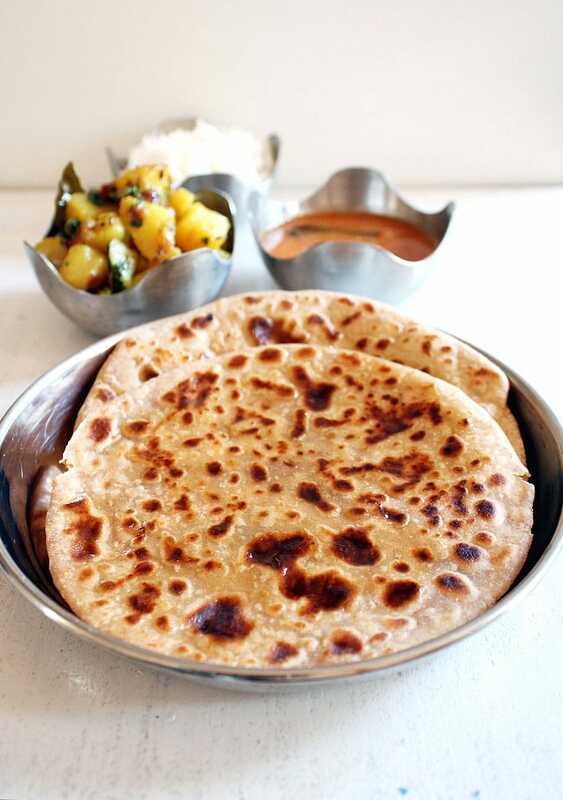 Puran poli – Indian stuffed bread with sweet lentil filling. It is also called vedmi. 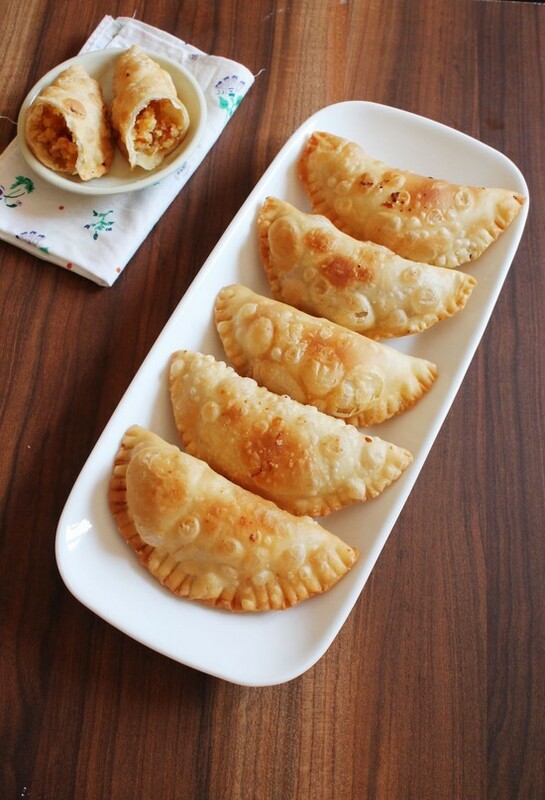 Mawa gujiya – The outer layer is made from all purpose flour. While the stuffing is made from mawa, sugar and nuts. 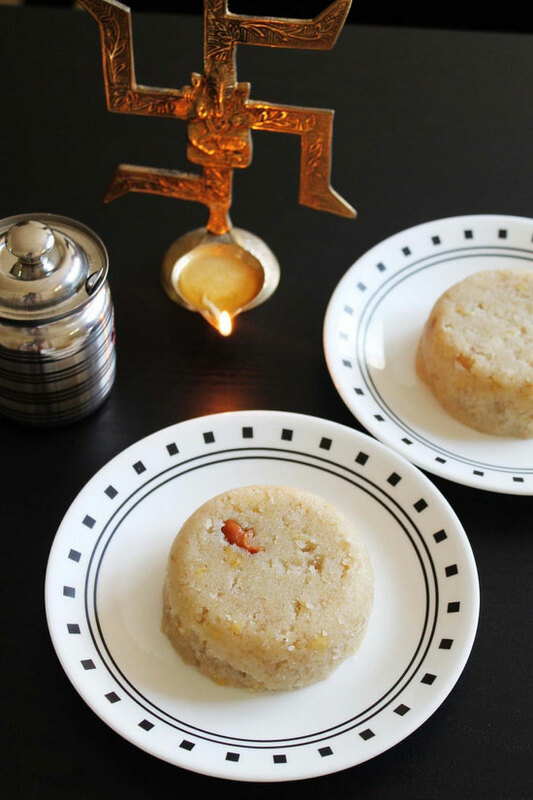 Karanji – traditional Maharashtrian sweet snack recipe. 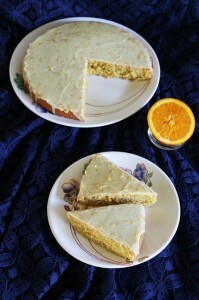 It has sweet coconut stuffing with crispy crust. 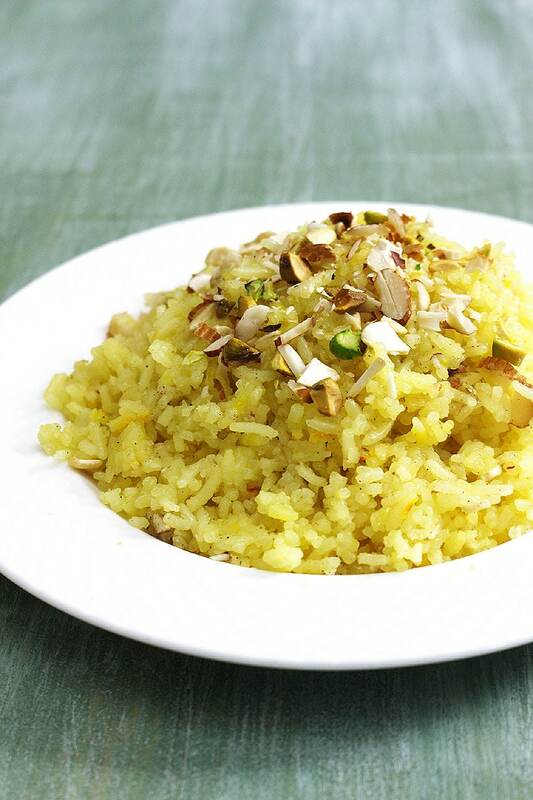 Meethe chawal (Zarda Pulao) – this is saffron flavored sweet rice garnished with chopped nuts. 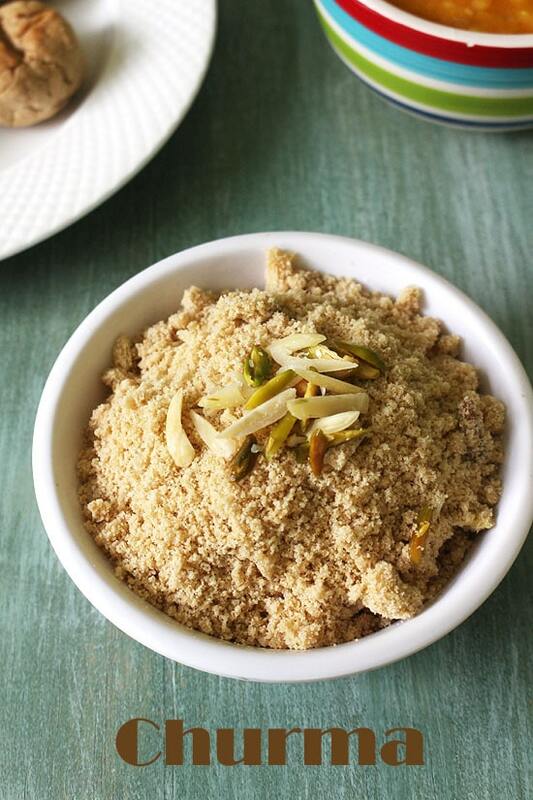 Churma – This is rajasthani churma recipe made from ground bati and mixed with powdered sugar and ghee. Garnished with nuts. 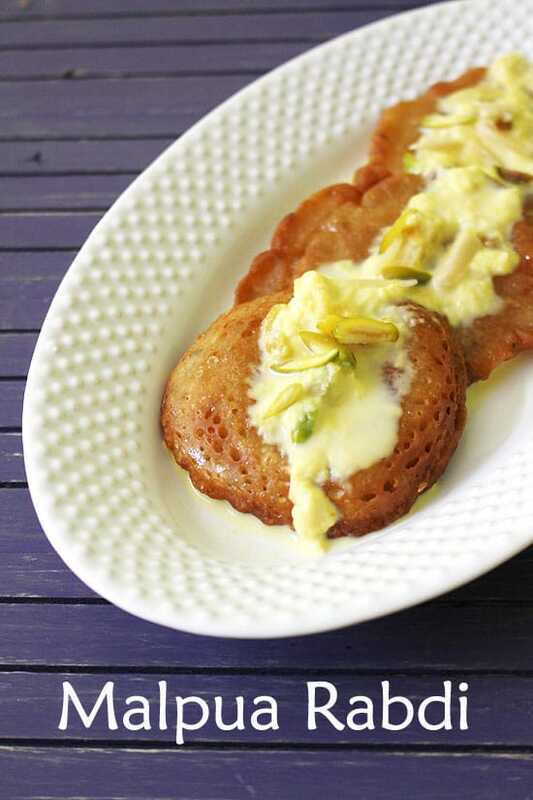 Malpua – This is a fried pancake which is made from all purpose flour batter. Then dipped into sugar syrup and then topped with rabri. 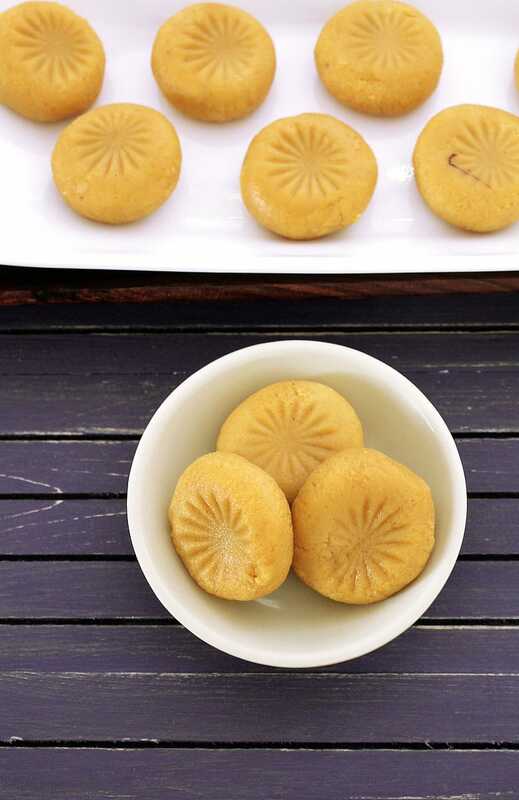 Plain Nankhatai – traditional eggless Indian cookies. 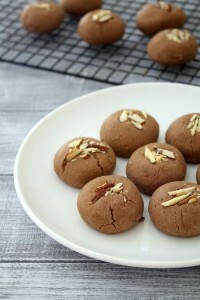 Whole wheat nankhatai – little healthy take on nankhatai. 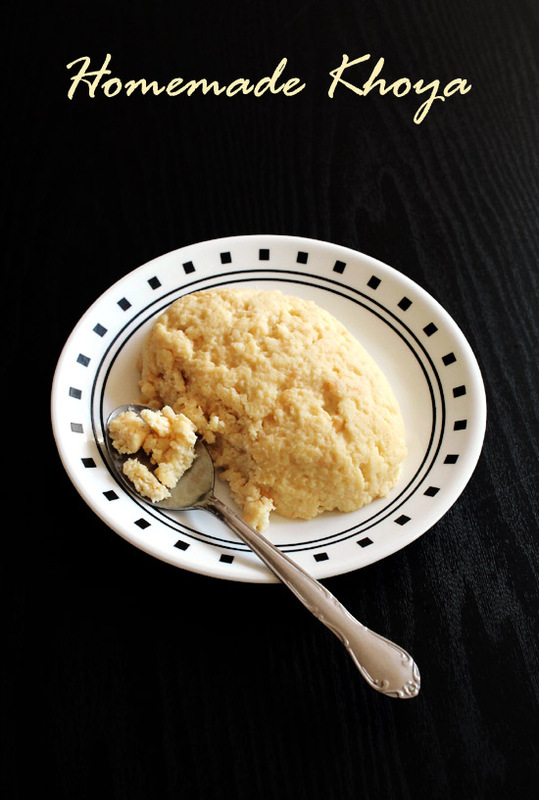 Instant khoya recipe – quick and easy way of making khoya from milk powder. Happy Diwali kanan!!!! Thanks for sharing Diwali sweets And Snacks. It’s Very Helpfull.